NamPower composite hub wheel brushes are also safer than wire wheels. 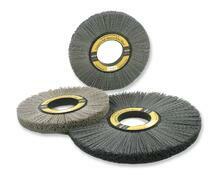 Plus, NamPower wheel brushes offer a performance advantage over non-woven abrasive brushes. The NamPower Resource Guide provides complete information about NamPower wheel brush selection and use, but this blog entry outlines five tips for cutting finishing costs with these high-performance nylon abrasive brushing tools. NamPower composite hub wheel brushes feature nylon filaments with either silicone carbide or diamond abrasive. The base material of the workpiece determines which abrasive type to select. Use silicon carbide abrasive for industrial metals like aluminum and steel. Use diamond abrasive with hardened tools steels, high-speed steels, carbide, plasma-sprayed, and nitride-coated surfaces. Your surface finishing requirements determine which grit or mesh size you need. Silicon carbide abrasive comes in coarser and finer grit sizes. Choose coarser grits for heavy-duty deburring, or when a finer finish is not required. NamPower diamond abrasive wheel brushes come standard in 600 mesh, but additional mesh sizes are available upon request. Did you know that the diameter of a NamPower wheel brush should be larger than the cutting tool that was used to machine the part? Remember this tip when ordering silicone carbide wheels, which come in 6” (152 mm) and 8” (203 mm) diameters; or when ordering diamond abrasive wheels, which come in 4” (100 mm), 6” (150 mm), and 8” (200 mm). Tool diameter also determines whether a NamPower wheel brush is more flexible or more aggressive. As a rule, larger-diameter tools are less aggressive and more flexible. Smaller-diameter wheel brushes are less flexible and more aggressive. Trim length affects flexibility and aggressiveness, too. Longer trim lengths are more flexible. Shorter trim lengths are more aggressive. NamPower composite hub wheel brushes can be used with or without a coolant. Heat adversely affects the life and performance of nylon filaments, however, so use a coolant whenever possible – especially at high speeds. For recommended surface feet per minutes (SFPM) under wet or dry conditions, and for cut depth recommendations and recommended revolutions per minute (RPM), download the NamPower Resource Guide.